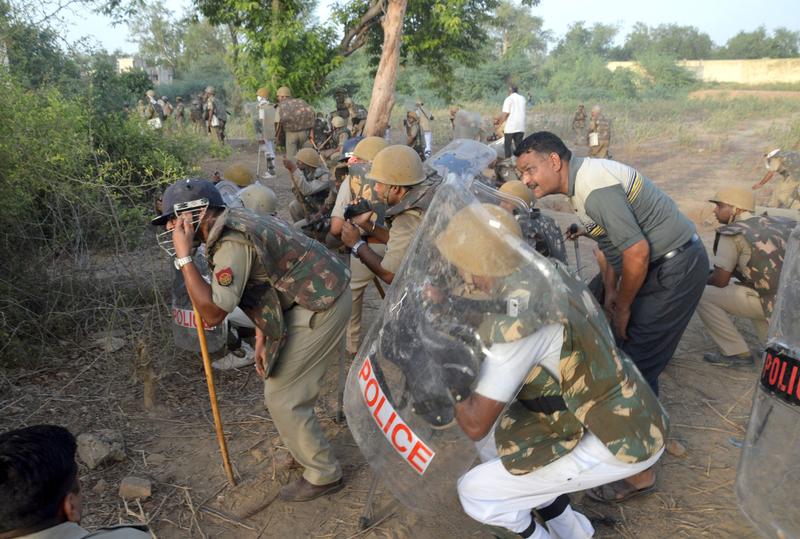 Indian police are pictured during a clash with members of a sect said to have been living illegally at the Jawahar Bagh Park in Mathura, Uttar Pradesh, June 2, 2016. Indian authorities said Friday they planned to crack down on a self-styled revolutionary sect, a day after 24 people were killed in clashes with police as officers tried to evict some 3,000 sect-members from a public park in Uttar Pradesh. Two officers were among the dead. “The situation is under control. Several FIRs [First Information Reports] have been filed and more are in process against them. We are taking all possible action to bring them to justice,” Mathura City Magistrate Ram Araj Yadav told BenarNews on Friday. Superintendent of Police Mukul Dwivedi and Inspector Santosh Kumar Yadav were killed when a police team reached the Jawahar Bagh Park in the temple town of Mathura on Thursday, and were attacked by a crowd armed with guns, grenades, swords and knives, police said. “We knew they had arms but did not know they would fire at us,” Uttar Pradesh police chief Javeed Ahmad said. The police were following orders of the state’s High Court to evict some 3,000 members of the little-known group Swadhin Bharat Vidhik Satyagrah from the park, officials said. “Soon after the attack, we got reinforcements and launched a counter-attack on the camp and successfully cleared the area,” Agence France-Presse quoted Ahmad as saying. During the police operation, some of the sect’s followers had set fire to huts that stored gas cylinders and explosives, he said. “Twenty-two of their people have died, out of which 11 have died due to burn injuries. One of the dead is a woman,” Ahmad said told reporters, according to AFP. Officers recovered a large cache of arms from the group, which claims allegiance to Indian freedom fighter Subhash Chandra Bose, police said. They added that they had arrested 368 members of the sect, but its leaders were on the run. The group, purporting to be social and political revolutionaries, had occupied the 260-acre government property since 2014, while making demands to remove the Indian president and prime minister and to replace the Indian currency. “These people claimed that they were living in Ghulam Bharat (Dependent India) and wanted freedom. Neither did they believe in the constitution nor the municipality system. Law was nothing for them. They collected huge funds under the guise of these activities from foreign countries. They did not see themselves as citizens of India,” Yadav said. Ahmad told reporters that the chief of the outfit, Rambriksh Yadav, who could not be located as of press time Friday, would be charged under the stringent National Security Act. “We knew they had arms but did not know they would fire at us,” Ahmad said. “A mistake has happened – the police went without full preparation. There was so much danger involved. No one knew how many explosives [they had],” Uttar Pradesh Chief Minister Akhilesh Yadav said. “When the administration did not act on the initial orders of the court, we filed a contempt petition on which the High Court issued notices to government agencies. It is on that they went yesterday but met with this kind of fate,” he said.